£500m contract for Javelin Park incinerator signed with Urbaser Balfour Beatty. Biggest contract ever signed by Glos County Council. Thousands of locals have written letters of objection. Only a couple of council officers and Cabinet members have actually seen the contract. Glos County Council's own planning committee unanimously refuses planning permission, one month AFTER the contract is signed. Dept for Communities & Local Government under Eric Pickles overturns GCC decision on a technicality and grants permission for the project. There is a major public outcry. Labour councillors propose cancelling the contract. Campaigning group GlosVAIN presents a petition with over 7,000 signatures calling for cancellation. Campaigning group 38 Degrees presents a petition with over 3,000 signatures requesting transparency and sight of the contract. The motion to cancel is lost by 3 votes after Leader of the Council Mark Hawthorne states the contract will save the County £150 million and cost up to £100 million to cancel (figures now known to be deeply misleading and inaccurate). A tribunal judge was later to state: "At that stage, in our view, the Council's obligation to act transparency was particularly strong as was the public interest in the exact position in relation to the compensation payable..."
Freedom of Information requests are made of GCC requesting sight of the full contract by GlosVAIN and others. GCC only releases partial information, citing "commercial confidentiality". The GlosVAIN request spent the following 18 months being delayed and refused by GCC, eventually leading, due to the sheer persistence of requester Cos Ttofa, to a Tribunal court case. Sell-out showing of film Trashed about the perils of both landfill and incineration at Stroud VUE cinema, presented by star and narrator Jeremy Irons. Survey of Haresfield residents shows 98% oppose the Javelin Park incinerator. Toxin Free Teaparty protest held at the gates to the site. Legal challenge brought by Stroud District Council on the planning reversal goes to the High Court but is not upheld. Rival recycling plant project Community R4C comes into existence with much local support. The Government's Information Commissioner orders GCC to disclose the full contract. GCC is silent. GCC sets aside a further £17 million of Council funds for Javelin Park, without consultation - and agrees a Revised Project Plan and new terms and conditions which still have not been fully revealed to this day. This may be illegal, as there was no competitive tension and the contract was effectively completely re-negotiated - not on grounds of value for money but on "affordability". We now know that the £17 million set aside here was the only way the Council could bring the contract within its waste budget for the next 5 years - a budget planned to expand disproportionately just to cope with the deal, while other budgets such as social care suffer drastically. GCC appeal the Information Commissioner's decision on the original 2013 contract, pushing the Freedom of Information request into a court hearing situation, scheduled for the summer. Public demonstration at the offices of developer Urbaser Balfour Beatty, demanding to see the contract. Community R4C share offer launched, raises £80K from community investment. "Talking Rubbish" seminar in Cheltenham featuring Jonathon Porritt, whose 8 principles of good policy making are all failed by Javelin Park. Waste consultants Eunomia predict overcapacity of incineration in the UK very soon. Community R4C present cheaper, greener alternative. Freedom of Information Tribunal hearing takes place, with GlosVAIN's Gerald Hartley representing the public interest in court. By this time, GCC has spent over £170,000 in legal fees defending the confidentiality of the contract. Ground broken at Javelin Park. Due to a County Council IT blunder, full 2013 version of contract is revealed and publicised by 38 Degrees. Key figures are revealed and the contract is referred to a procurement specialist for analysis (via Environmental Law Foundation). Tribunal ruling orders release of contract information, roundly condemning GCC's secrecy: "in our view there was a significant public interest in the disclosure of the entire contract, in the interests both of transparency and accountability, ie to enable the public to be informed as to exactly what the Council had agreed on their behalf and its long-term consequences and to hold it properly to account... the fact that the public authority has disclosed some information in the past cannot be relevant to the issue of whether they should have disclosed more." Among many revelations, GCC was criticised on its "wish to protect the confidentiality of legal and technical details that are novel in order to sell them on to other local authorities [!!!] ... we do not think that there is a particularly great public interest in the Council being able to commercially exploit a scheme which is apparently designed to avoid the normal regulatory regime." Contract is found to be an appalling deal for the County, heavily front-loaded so that GCC is obliged to pay 150% of market rate for over 100,000 tonnes/year of waste regardless of whether it supplies that waste... and what the public had been told about savings and cancellation costs is also revealed to be UNTRUE. Major presentation of analysis by Community R4C with guest Jeremy Irons. A further FOI request is made of GCC for Ernst & Young report mentioned by the Tribunal as justification for GCC's stated high cancellation figures. Legal complaint is filed by Community R4C with the Competition & Markets Authority as contract is found to be anti-competitive in its pricing structure, creating problems for investment in cleaner alternatives. CR4C also submit complaint to the council’s external auditor, claiming the contract does not represent Value for Money. Lady Godiva protest - Anna of Minchinhampton rides naked through Gloucester protesting the toxic nature of incineration. County Council elections return a large Conservative majority. Open letter sent to all new Councillors summarising problems with Javelin Park project. Allegations of Misconduct in Public Office under Common Law filed with the police by Jojo Mehta against GCC Leader Mark Hawthorne, Deputy Leader Ray Theodoulou and Javelin Park Project Manager Ian Mawdsley on the basis that these men persistently withheld information from and misled public and press on the subject of Javelin Park. An opposition Council motion to halt works at Javelin Park and investigate is voted down, and a public demonstration storms into Shire Hall lobby. FoI request returns a redacted report which suggests the 2015 revised deal is even worse for GCC regarding tonnage of waste the County is obliged to supply. CID unable to find proof positive that council leaders definitely knew the information they were providing was false - but they recommend an audit investigation into the contract which they can see is problematic. Resistance steps up a notch - from a naked protest and a mock funeral march, to the (traditionally Tory) Tax Payers' Alliance joining the campaign in Gloucester, to a full camping-out blockade of the Javelin Park site by a sofa party, ending in 4 arrests as protesters sat down and prevented a string of cement trucks from entering the site. Oddly illogical combination of charges were made (aggravated trespass and obstruction of the highway - the former was then dropped). 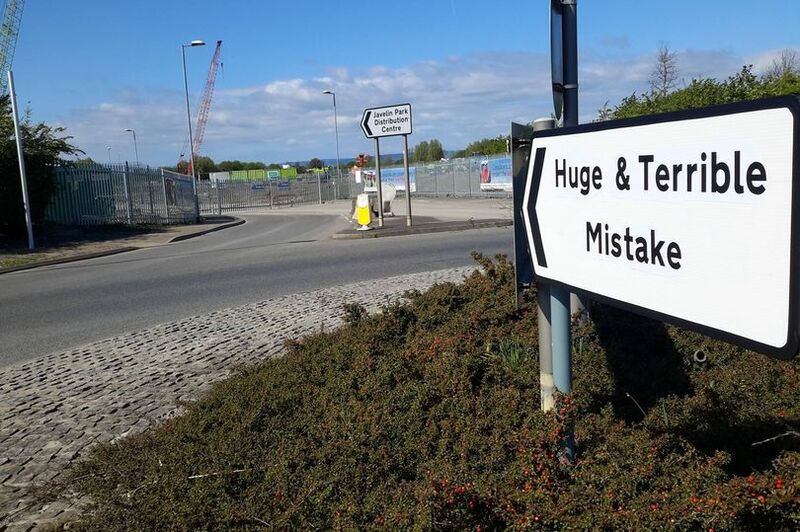 GCC announces that cabling from the incinerator to the national grid is going to involve digging up Stonehouse High Street (for the 3rd time in recent years) - Stonehouse traders furious. Large gathering of elders and youngsters at the incinerator site, where several stories of concrete are now visible - children wear gas masks to highlight toxic pollution aspect. GCC Leader Mark Hawthorne is asked an on-the-day oral public question in a meeting of full council as to whether he believes the council has a duty to be clear and honest with the public. He answers "Absolutely" but the council refuses to minute this despite explicit requests. GCC Leader Mark Hawthorne successfully proposes to the council's Constitution Committee that on-the-day oral public questions be disallowed henceforth. NoMoInGlo.org is started, to make visible the continued resistance to incineration in Gloucestershire. Grant Thornton, GCC's external auditors, in process of investigating Javelin Park contract at the request of Community R4C. "Sofa party" arrestees plead Not Guilty at Cheltenham Magistrates Court. Magistrates agree to Community R4C submitting a report on Javelin Park project as evidence of why the protesters believed UBB's business there to be unlawful. Trial date provisionally set for March 2018. Court case against "sofa party" protesters dropped. Police reports indicate they expected the arrestees to plead Guilty. When they pleaded Not Guilty, the CPS examined the evidence and discontinued the case. Local builder Sid Saunders goes on hunger strike on the steps of Shire Hall, Gloucester, to demand full release of the renegotiated incinerator contract. GCC ignores him, refuses to accept questions on the incinerator in a cabinet meeting, claiming irrelevance despite air pollution being specifically on the agenda. However, Shire Hall staff are supportive and response from the public is overwhelmingly sympathetic, interested and heartwarming. Increased press coverage. Information Commissioner issues decision notice on 12-month-old Freedom of Information request for the full accountants' report which informed the renegotiated incinerator contract. Excellent summary HERE. GCC is ordered to un-redact most of the information and make it public and is told in no uncertain terms that it is in breach of regulations by constantly delaying FoI responses. This is a major vindication of Sid's hunger strike. Sid continues hunger strike but strikes camp at Shire Hall with plans to address the wider issue of how we deal with waste as a society. He is planning on taking his strike to London to bring attention to the need for circular economy and for abolishing single-use plastics. GCC appeal to the Information Rights Tribunal against the latest ICO ruling, with a hearing set for January 2019. Just before the Christmas break, GCC drop their appeal against the ICO ruling, and release figures used in the renegotiated contract, revealing an increase a 30% increase in costs, pushing the lifetime cost of the contract £100m higher, to more than £600m. GCC also publish a new report they have commissioned from Ernst and Young calculating claiming it shows the project as value for money. Instead, the figure reveals that even in the best case scenario, they have locked the county into 25 years with one of the most expensive gate fees in the country. A large cross-section of local politicians, campaigning groups and concerned individuals sign an open letter requesting a full and independent public inquiry. “Money to Burn” demonstration is held by NoMoInGlo at the incinerator site, joined by local Extinction Rebellion activists who block traffic past the site for 2 hours. “Cash” is burned to illustrate the county council’s treatment of public money. Local circular economy group Community R4C files a High Court claim against Gloucestershire County Council on grounds that the council breached procurement law when renegotiating the incinerator contract 2015 - the project should have publicly re-tendered. County Council officially refuses demand for public inquiry, saying it would be a waste of public resources.